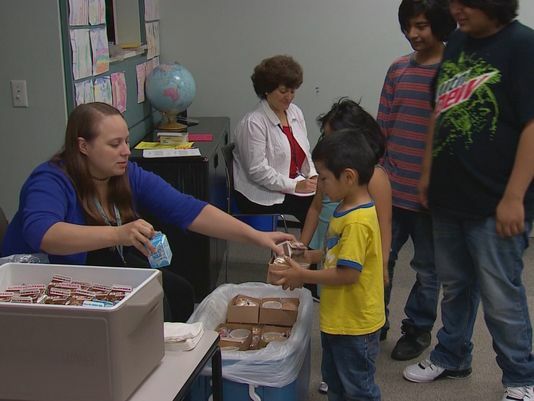 This summer, 19 Dallas Public Library branches are providing free lunches and snacks to children and teens under age 18, in partnership with the nonprofit hunger organization Equal Heart. Youth who receive lunches and snacks this summer can also take advantage of the many programs and activities being offered at the Library, including the Mayor’s Summer Reading Challenge, Science, Math, Art, Reading, and Technology (SMART) Camps, Summer Book Buddies and hands-on STEAM programs and performers. Audelia Road, Monday-Friday, Noon to 12:45 p.m.
Bachman Lake, Monday-Friday, Noon to 12:45 p.m.
Dallas West, Monday-Friday, Noon to 12:45 p.m.
Forest Green, Monday-Friday, 1 to 1:45 p.m.
Grauwyler Park, Monday-Friday, 1 to 1:30 p.m.
Hampton-Illinois, Monday-Friday, 2 to 2:45 p.m.
Highland Hills, Monday-Friday, Noon to 1 p.m.
J. Erik Jonsson Central Library, Monday-Friday, Noon to 12:45 p.m.
Kleberg-Rylie, Monday-Friday, 1 to 1:45 p.m.
Lochwood, Monday-Friday, Noon to 12:45 p.m.
North Oak Cliff, Monday-Friday, 12:30 to 1:15 p.m.
Park Forest, Monday-Friday, Noon to 12:45 p.m.
Lancaster-Kiest, Monday-Friday, Noon to 12:45 p.m. Pleasant Grove, Monday-Friday, 11 to 11:45 a.m.
Polk-Wisdom, Tuesday-Thursday, noon to 1 p.m.
Prairie Creek, Monday-Friday, 1 to 2 p.m.
Skyline, Monday-Friday, noon to 12:30 p.m.
Timberglen, Monday/Wednesday/Friday, noon to 12:45 p.m.
White Rock Hills, Monday-Friday, Noon to 12:45 p.m. Proof of need or pre-registration is not required to receive the meals. The free lunch program will continue through Aug. 17. Meals are funded by the Texas Department of Agriculture’s Summer Food Service Program.